I found this in one of the file cabinets at the transmitter site. It was apparently used as scrap paper because there is what looks like connection information for a remote control system scrawled on the back. I thought it was interesting in as it shows a 6 am sign on and the type of programming, source and exact times each element ran. For Origins, YN = Yankee Network, BPT = Local Studio (Bridgeport) and NBC = NBC. 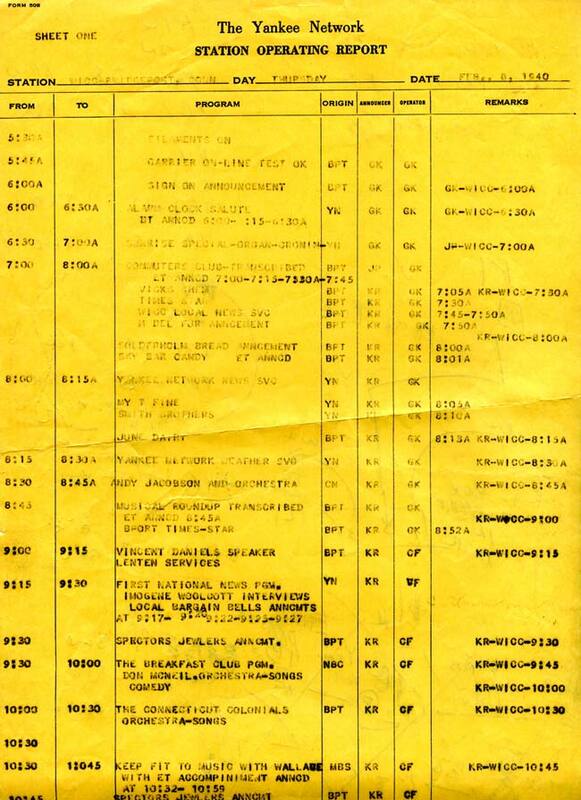 Program logs for later years (1943) show the Alarm Clock Salute was received via FM from W43B (Paxon, MA) on 49.3 MHz. Sign off was at midnight. It must have been cold in that little house out on the island in February. Anyway, I’ll save these in my radio station history files.